I just did a quick Google search and it looks more like there are over 500,000 homeless in the USA. I suppose a number of these people are in shelters or living in tents, so maybe 200,000 is an accurate number of people actually sleeping on the streets with no shelter at all. A very good point made here. Mostly because they choose that lifestyle. There are a lot that dont and do need help but a lot of them dont wont help. And vacant buildings everywhere why are people on the streets? Misplaced priorities. Perhaps if “christians” gave 10 percent tithe plus offerings, instead of the 2.5 percent statistics say they give, churches could do so. I’ve estimated that for a mere $25 million dollars, we could end the homelessness in my city (Charlotte) this year. We only have an estimated 2200 people in our city of nearly a million that are officially homeless Such is merely the budget of one or two mega churches in Charlotte. My church alone last year had that much revenue. But instead we prefer well paid pastors and large auditoriums. this post sounds like JUDAS…. Why place the blame on an organization or institution for something you can do but are not? Nelson who should take care of the homeless? families rather than the church? because some of them have chosen to live there. Its an amazing thing call free will. Alphonso what about the one who didn’t choose that way of life and fell on hard times? It’s not easy to decipher sometimes. In my opinion, some in this thread have forgotten the “church” is not an organization, but rather the people are the Body of Christ. Many will say the church should do this or pay for that, but never stop to realize they are indicting themselves if they as believers have done nothing. 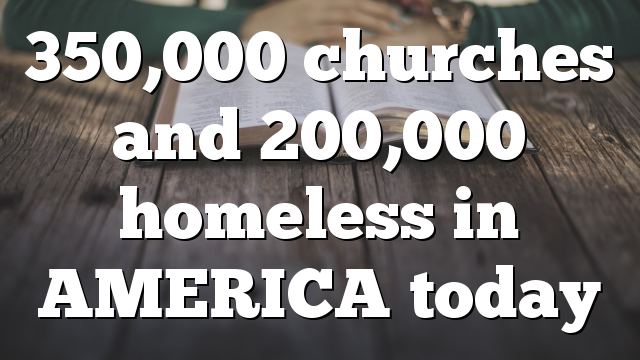 They are right the church should minister to the homeless. They are the church! I agree some pastors are charlatans, but to generalize and say all pastors are this way is simply wrong. it is because of our selfishness that people sleep on the street. The Church as a body of Christ has technically nothing to do with it, but the leaders of the church have become too selfish to offer help to the poor and needy. I agree that it reflects on the nature of the priests and the pastors who have gone far away from the Lord. It’s nothing like as simple as that. True but there ars some Missions who sleep the homeless Bigger Churches could do more but they use their mooney to buy big jets,after all does your Pastor really need one or 2?? In a nutshell, liberation theology actually was “born” not in Latin America, but in the bowels of the KGB, as part of a broader strategy to promote Soviet influence in the region that included backing the National Liberation Army of Colombia (FARC), the National Liberation Army of Bolivia, and, of course, the regime of Fidel Castro in Cuba. KGB also encouraged the World Council of Churches, the largest Protestant federation in the world, to support liberation theology. Its scarey the things the homeless population does and says. Its not as safe and romantic a ministry as you might think. Would the homeless situation be altered significantly if the church took care of it own orphans and widows? I don’t think so. I heard a preacher on Youtube say his mission wasn’t to feed the homeless but to get people saved. He said he’d buy a homeless man a sanwich and share the gospel and if he did notaccept it that would be the last sandwich he would buy him. Too extreme IMO. The question ‘how does the love of God dwell in him?’ fromI John comes to mind. But I agree feeding our own is the priority. Do good to all men, especially them that believe. I also noticed in Indonesia church buildings (usually office space for Pentecostal/Charismatics) get locked up but men from the neighborhood may sleep at the mesjid. That’s pretty common in Minang areas I hear. That hard tile floor would be worse than a Chinese matress. My wife was watching on her ipad so I don’t know it. Wasn’t worth watching. He did not present a Biblical case for that point.